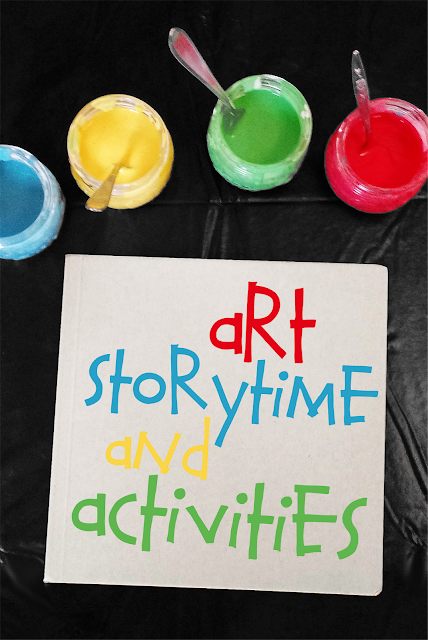 We love mixing storytime with activities at my library, and one of my favorite themes is (obviously) art! There are really great books out there to sneakily teach aspiring artists some of the fundamentals of art while still holding their attention, and a lot of these books have some awesome activities we've used to really drive the lessons home. One amazing series of books is the Dot, Sky Color, and Ish by Peter Reynolds. All of these books address different issues with art creation and getting over little speed bumps that trip us all up. The Dot has potential for a lot of really great activities, but really all you have to do is draw a circle on the page and let them go to town. Another good set of books is Mix It Up and Press Here by Hervé Tullet. 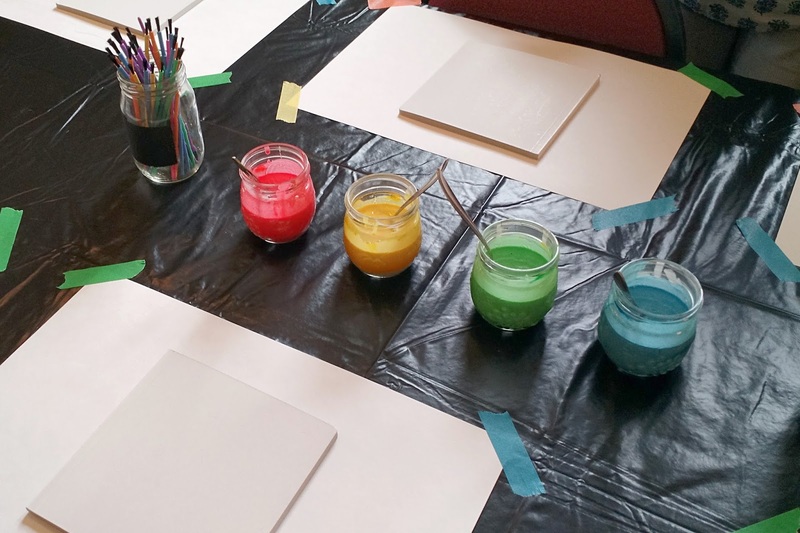 These books teach colors and color mixing in a fun and interactive way. 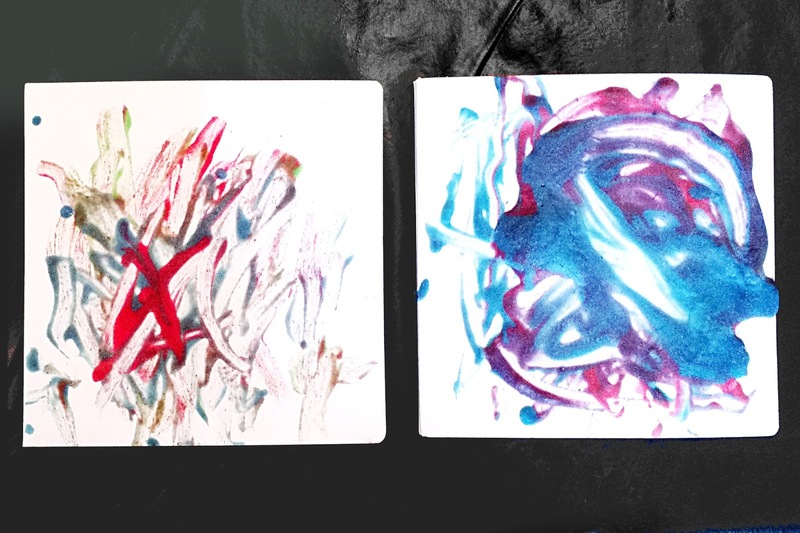 When we did a painting activity later, one of the kids said "I know red and blue makes purple because of that book." Pretty good for a preschooler! Art's Supplies by Chris Tougas is a humorous adventure into the world of Art and his talking art supplies. But on a deeper level, this book talks about and has examples of many of the basic art supplies we use on a regular basis. A great book for teaching that accepting mistakes in art is sometimes a good thing, A Beautiful Oops by Barney Saltzberg is a book that is a must have for any child that is too focused on coloring inside of the lines. It's the perfect book to read when your child is upset because their art didn't turn out just the way they wanted. 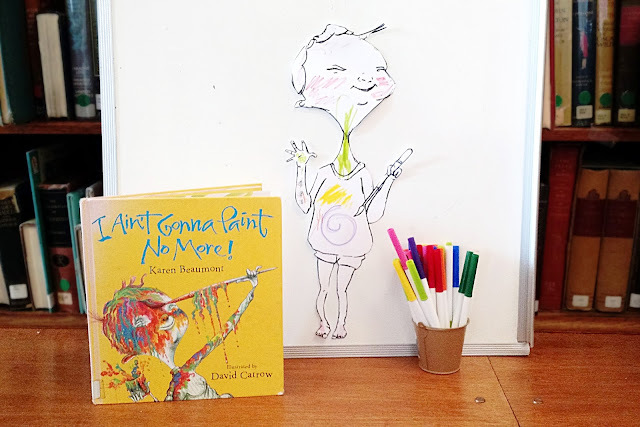 Finally, we love the book I Ain't Gonna Paint No More! by Karen Beaumont. Not only does it teach the age old lesson of "you can't paint on the walls" in a fun way, it also has a great rhythm that makes it so much fun to read aloud. For this storytime we printed out a blank picture of the main character and had the kid's draw on him as we read the story. As our big activity, we had the kids puff paint some board book covers. We used the Microwave Puffy Paint recipe from the Artful Parent, and it worked like a charm. The only drawback was that since we used board books the cover would warp as you microwaved it, but in the end it still looked cool, and the pages themselves weren't damaged. If you'd like to replicated this activity, here's a link for Blank Board Books from Wal-Mart. 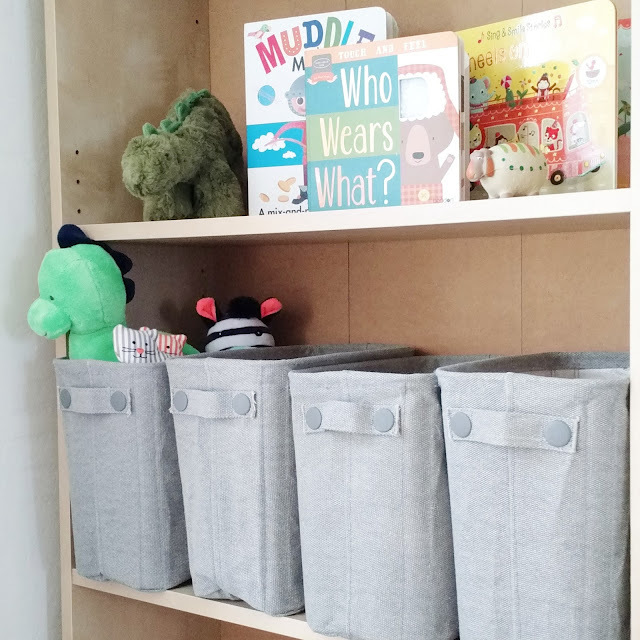 While designing my nursery I was presented with a problem. I already had a bookcase in the room: a nice, subtle BILLY from Ikea that I thought would fit in quite well. But when I started to search for storage options I ran into a wall. While there are a million and one options for the KALLAX/EXPEDIT series, finding a single box that could fit on the Billy took me hours. 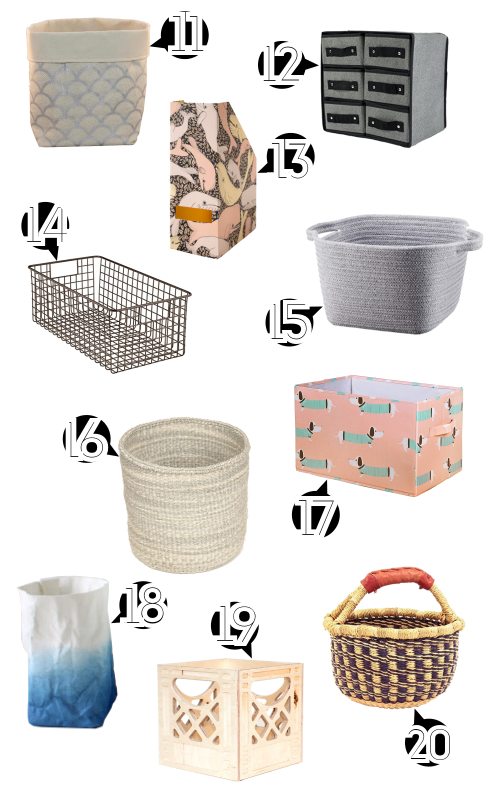 In my search, I finally came up with a formula that brought me lots of options, so I've picked out the cutest to share with you! 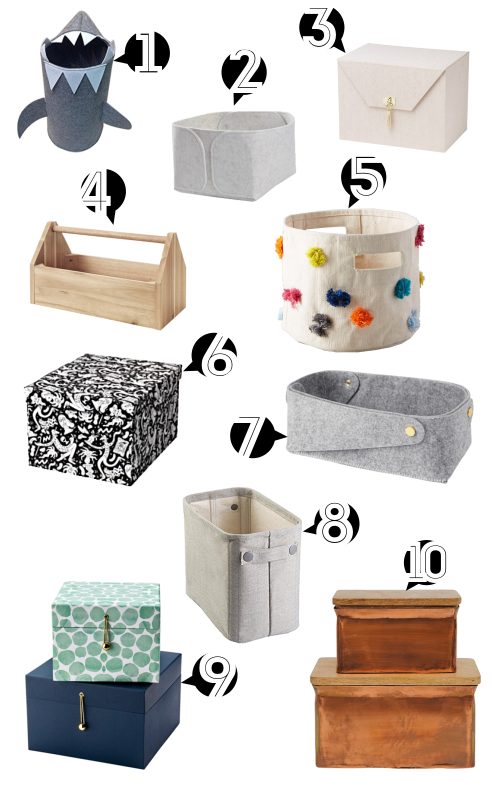 I ended up getting number 8, the gray fabric storage bins. They're coated with plastic on the inside and fit 4 to a shelf comfortably. They fit the vibe I was going for, and they didn't break the bank! Normally my mood boards for the fall are darker, but this season I've been feeling really colorful. I have to blame A Kailo Chic Life, Oh Happy Day! and Aww Sam for that. If you haven't checked out their colorful worlds yet, take this time to do yourself a favor and click on those names. Totally worth it. This blend of colors just generally leaves me smiling, and as a result, the stuff I picked for this board has a super fun vibe. It makes me want to wear colorful outfits and play with some super modern children's Cblock sets. 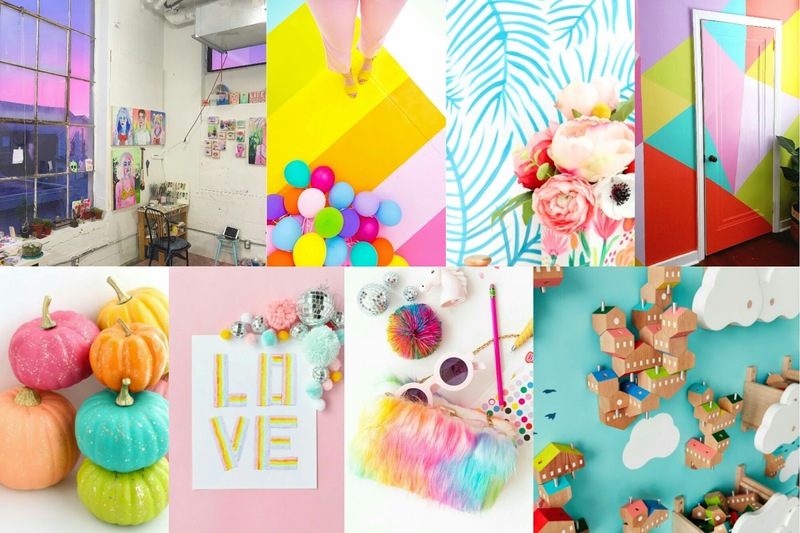 This is the studio of Shanna Van Maurik (nogobed on Instagram) and it is constantly a flood of colorful inspiration, and even more so when she photographs the vivid candy-colored sunsets seen out her wonderful windows. This is the kitchen from the studio of Aww Sam, and wow is it amazing, and this is only half done! I can't wait to see the completed project. This adorably painted planter is made even better with the gorgeous painted background. From A Beautiful Mess. I can't get over this wall from Sara Blumer of That's What Sarah Said. It's such a statement, and the fact that the door is painted too makes it the best. These colorful pumpkins were posted today, and as soon as I saw them I knew that I had enough inspiration for another mood board. They're from A Kalio Chic Life, and I those colors are just perfect. 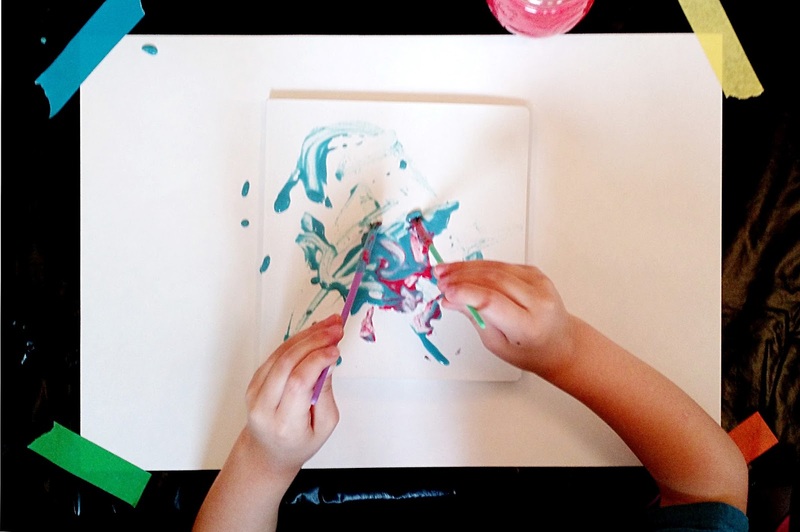 This super cute rainbow painting DIY Rainbow Paint Scrape was on one of my favorite blogs, Handmade Charlotte. I just love those colors! This fur clutch from Aww Sam is too cute. She actually had a few examples of this project, but there's something about this rainbow one that makes me want to make one SO. BAD. I have always been fascinated by art installations. There's something about immersing yourself in the artist's vision that is just so cool. And the only thing that makes that better is when the installations are interactive. Such is the case with this amazing block wall, a part of Spark, which is an annex of the Brooklyn Children's Museum. This specific piece is called "Sky Villages" and is by James Paulius. Modernmaven's Instagram. Like, the whole thing. This packed up their Colorado life, took a chance and moved out to Hawaii, and it seems to have worked out. Their new life totally fits their colorful and happy lifestyle. This adorable manicure from So Nailicious. I don't paint my nails, but this color scheme is too great. This POP UP cookbook by Katherine Sabbath. How amazing is this? Will I ever tire of her wonderful creations? Probably not.